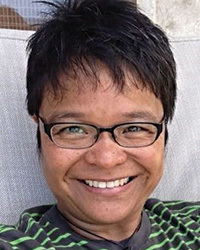 La Sarmiento has been practicing Vipassana since 1998, is a Guiding Teacher and Senior Retreat Manager for the Insight Meditation Community of Washington, is the guiding teacher of the IMCW LGBTQ and People of Color Sanghas, is a Lead Retreat Teacher and DC Coordinator for Inward Bound Mindfulness Education, and is a 2012 graduate of the Spirit Rock Community Dharma Leaders Training Program. La has been a bodyworker since 1992 and a Reiki Teacher since 2004 and also produces "Respectful Confrontation" workshops in Washington, DC where they reside. To learn more about La, visit www.lasarmiento.com. View La Sarmiento's upcoming programs.